Anothr is an instant messaging robot that sends alerts with the latest from your favorites blogs and news sites. It works with Google Talk and Skype, and the only thing you have to do is to add the bot as a contact (for Google Talk and other Jabber clients, the email address is anothr@gmail.com). Then you'll see a list of available commands, but the most important thing is how to add the feeds: you can either type the address of each site individually or type "opml" and then upload your OPML (most feed readers offer the option to export your subscriptions as an OPML file; if they don't, there must be some hacks to make this possible). The default interval for receiving updates is 10 minutes, but you can change it by typing "timer [number of minutes]". How can I export my feeds from Google Reader to OPML? 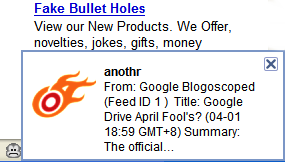 How to export your feeds from Google Reader? Click here (you'll get an XML). Next time, go to Settings, then Import/Export.